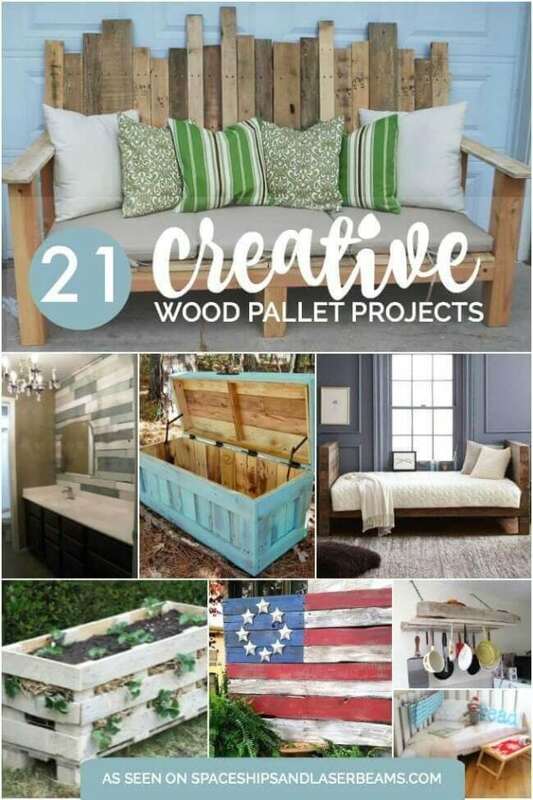 If you like DIY items for your home and yard that cost next to nothing, these 21 creative wood pallet projects are for you. 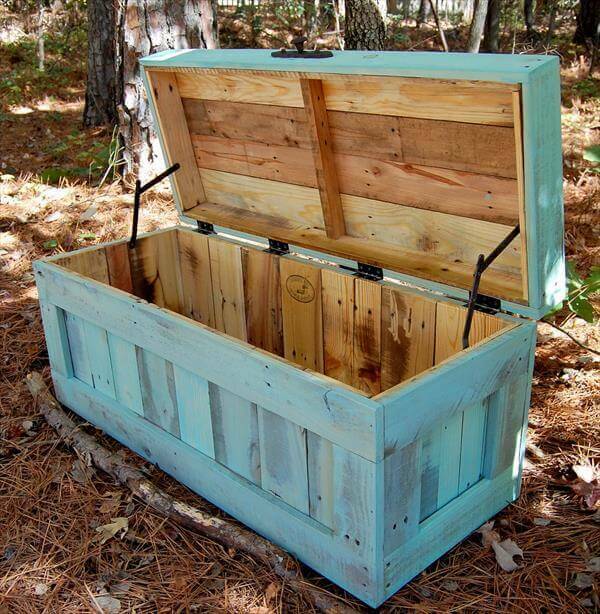 We’ve rounded up GREAT ideas for creating a pallet chest, a frame and even a chandelier. 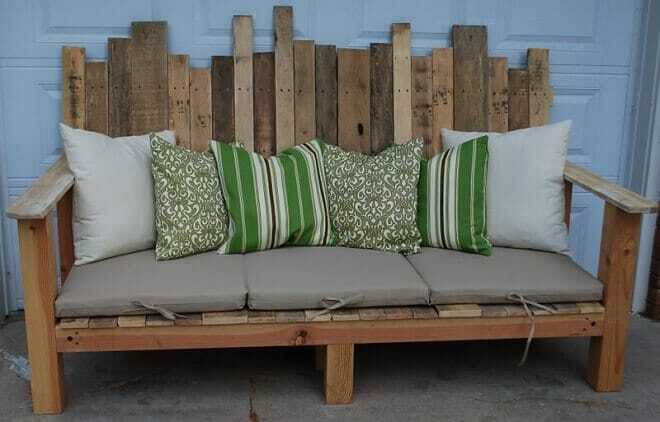 Or you can try your hand at making a pallet sofa or table for your outdoor patio space. How about stools or a porch swing? 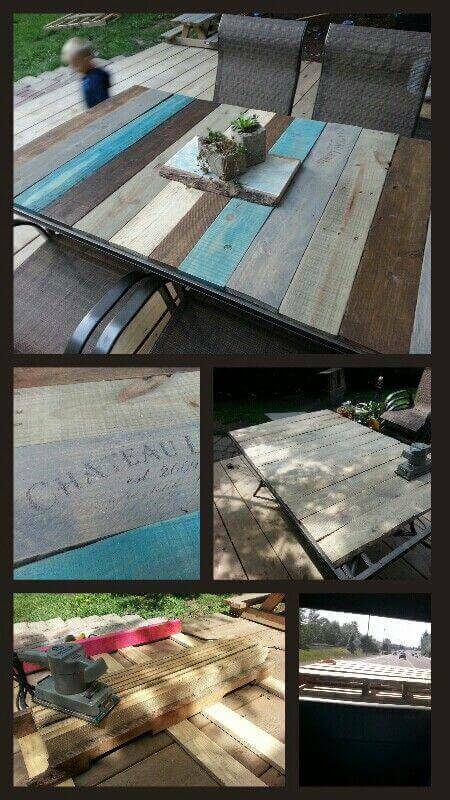 If you’ve been hoarding discarded pallets from local stores, now you know what to create. Check out these DIY Toy Shelves From a Used Tire for great ideas and inspiration for your toy storage. Tired of toy clutter in your back yard? Don’t miss these 15 Very Clever Outdoor Toy Storage Ideas. Create your own pallet wood stenciled table following this easy tutorial! This design features bigger sized pallets which yield larger plank sizes and therefore, chunkier table legs. The tutorial walks you through the steps of sanitizing the disassembled pallet with bleach and water before allowing it to dry for a week inside prior to cutting to size and sanding. Once assembled, screws are used to assemble the table prior to painting, distressing and stenciling! 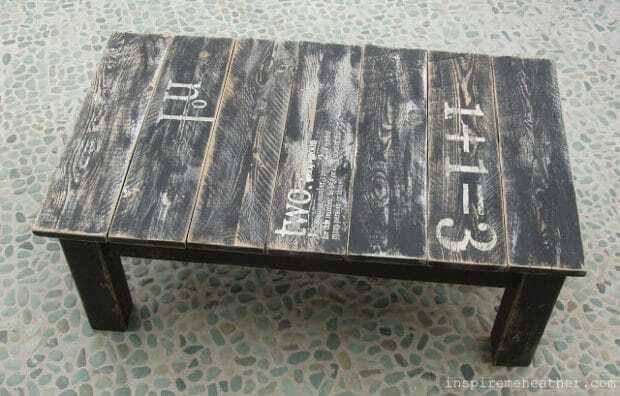 If a little hard work and use of power tools doesn’t scare you off, this do-it-yourself pallet bench project is pretty awesome, and provides a great outdoor seating area. 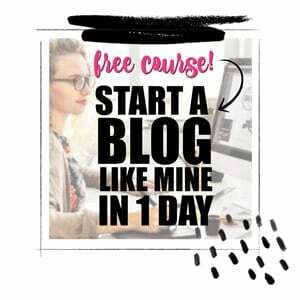 You’ll need pallets, plenty of space to build, self-tapping wood screws and 3×3 or 4×4 wood for the frame, 3 different saws (or a compound mitre saw), a sander, clear waterproof sealer and fabric for the pillows and any seat cushions. 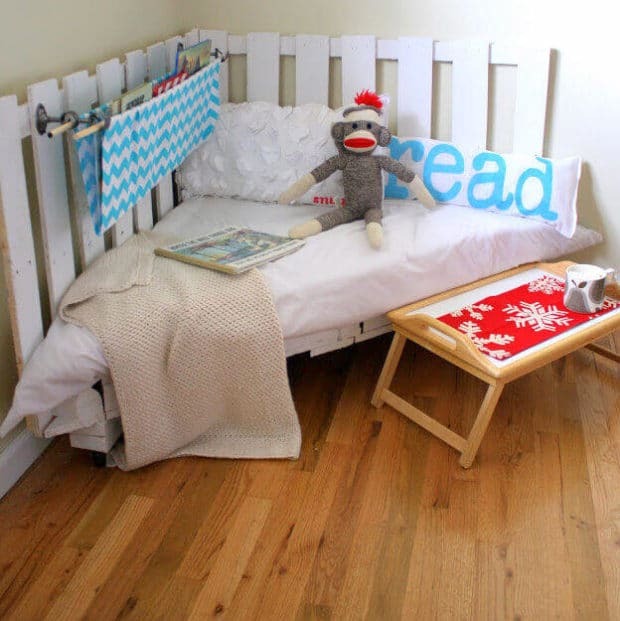 Calling all bookworms, this pallet reading nook tutorial is for you. While recreating this look is involved, it is a winner. To make this palette reading nook, you’ll need just a few supplies: 2 wooden palettes, 3 rolling casters, scrap pieces of a 2x (for cutting into 6” squares), sander and sandpaper, nails. 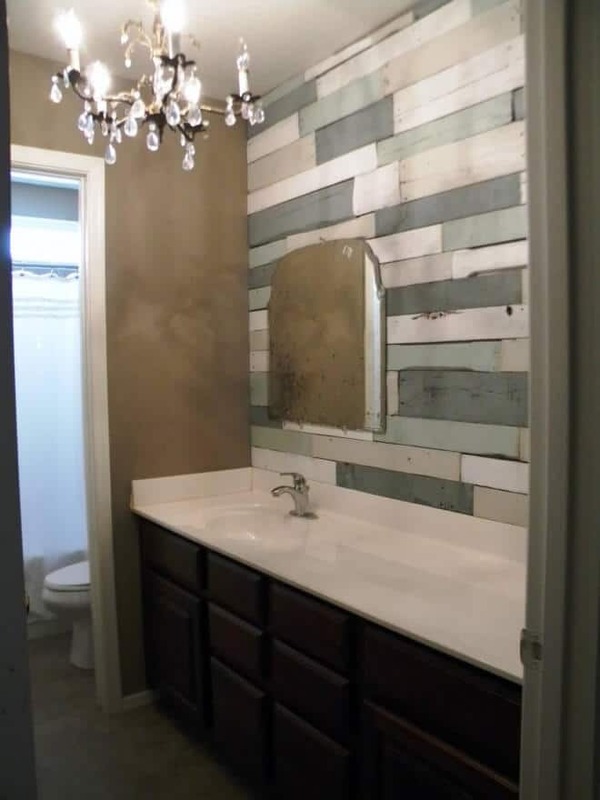 If you want to give your wall a massively new look, this creative wood pallet project is for you! You may not walk past another abandoned pallet again after this relatively easy DIY pallet wall idea. The hardest and most time consuming part will be taking the pallet apart so that you can repurpose the wood slats for your new wall. Use leftover paint or stain, and this project is literally free. With no (or very little) out-of-pocket cost you can build your own pallet vegetable (and fruit) storage rack. 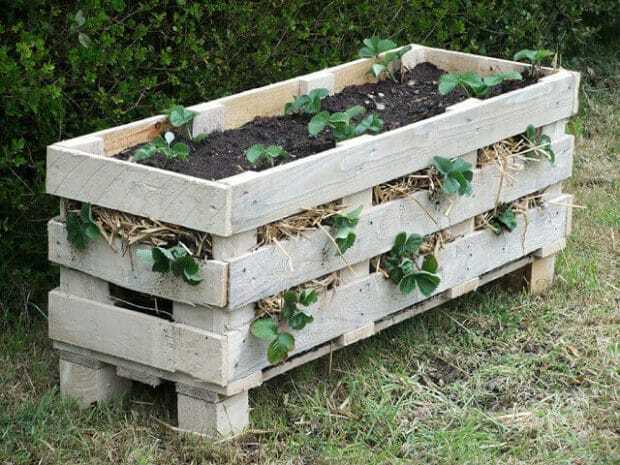 Fashionable and functional, this creative wood pallet project is a great way to organize your fresh vegetables and fruits. This three tier design allows for an abundance of storage and takes up less space due to its slim & sleek design. 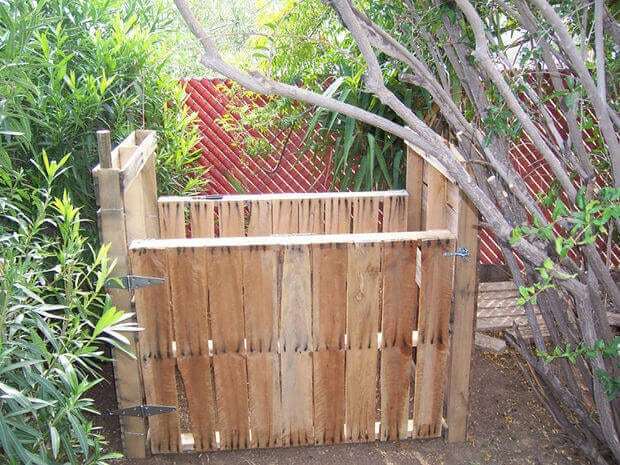 Go green and DIY your own pallet wood compost bin. Give a home to your grass clippings, the results of your plant, bush and tree pruning, and any other yard waste, plus food scraps. Creating a compost bin is easier and more inexpensive than you think! 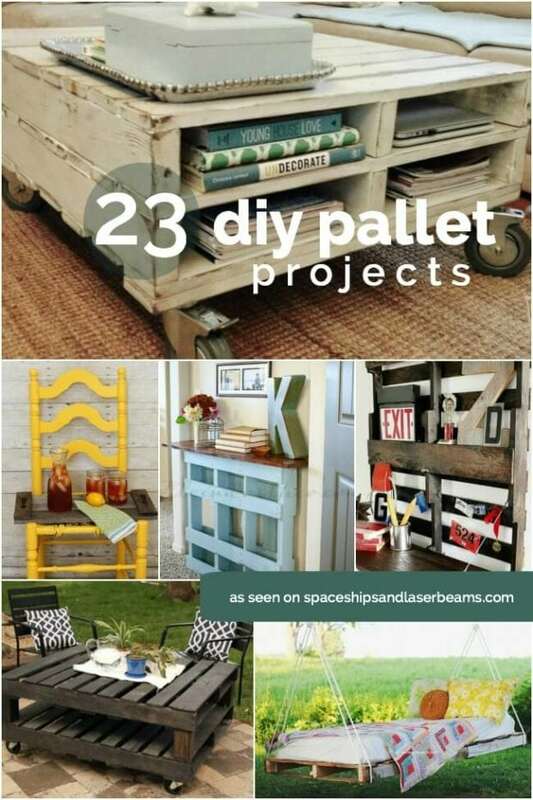 You’ll need recycled pallets, wire, hardware and basic tools to create this creative wood pallet project. Displaying pots, pans and various kitchen gadgets overhead is definitely trendy. 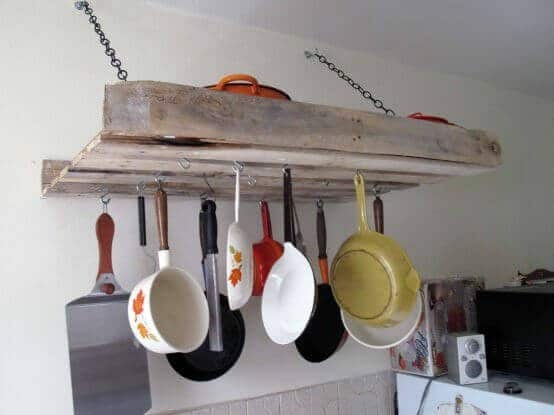 But building your own pallet rack for the kitchen is also a nice way to have your most used pots and pans in arms’ reach if you like to cook or lot. It also makes for a functional storage option if you are otherwise short on cupboard space. This easy DIY, only requires the addition of metal hooks and a sturdy chain for hanging. If you want a creative way to reuse pallet wood, consider DIYing your own pallet Adirondack chair. This tutorial has great tips on what kind of wood pallets to look for, where to find them, and how to complete the tedious task of disassembling them. 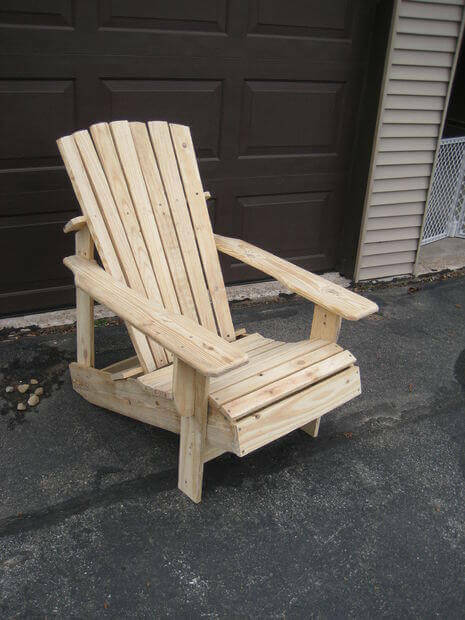 Additionally, there are great step-by-step instructions on how to construct the Adirondack chair, including a list of materials, tools and safety tips. Using a Sawzall, you can save a lot of time and most importantly, your sanity, by cutting through the nails (vs the tedious task of removing them to disassemble the pallet) for these awesome pallet high table stools. You’ll be ready to host a backyard summer party in no time. 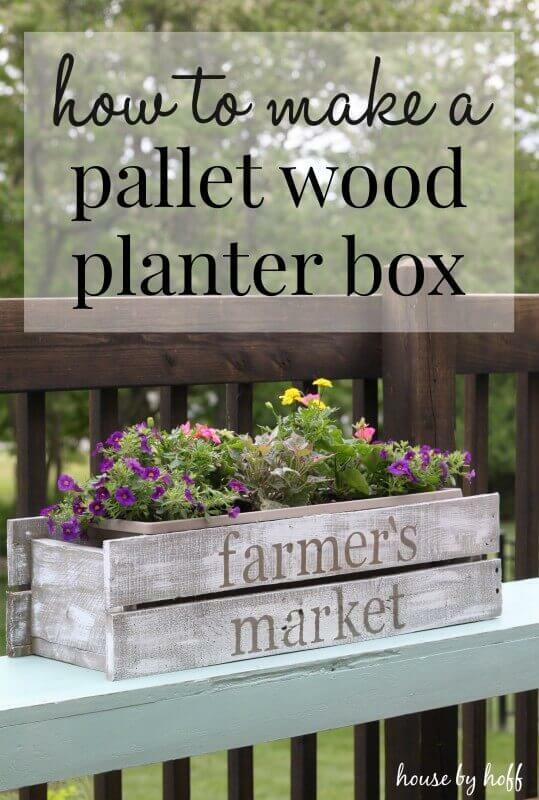 You’ll love the simplicity of this 2-step process for DIYing your own pallet wood planter box. This process involves building the pallet wood planter box around a rectangular plastic planter box, so you can be sure that it will fit. You’ll need pallet wood, a brad nailer and brads, paint and a paintbrush, plus vinyl letters to use as a stencil if you’d like to duplicate this look. This includes how to identify where a pallet is from and the type of treatment it has received to help stop the spread of foreign pests. The project requires that you start with a suitable pallet, but you’ll also need either a hand or jigsaw, electric drill or hammer, screws, nails, non-toxic paint and paintbrush and either a splitting wedge or iron mallet. 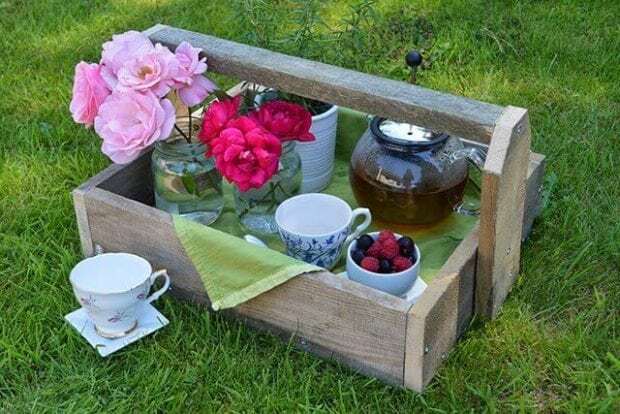 If you’ve got pallet wood laying around, snag it and DIY your own rustic trugs. You’ll be able to wander around your yard and collect favorite garden flowers and clippings. You can also use your trug indoors as a rustic home décor piece or even plant something directly in the trug for outside décor. Need indoor or outdoor storage? 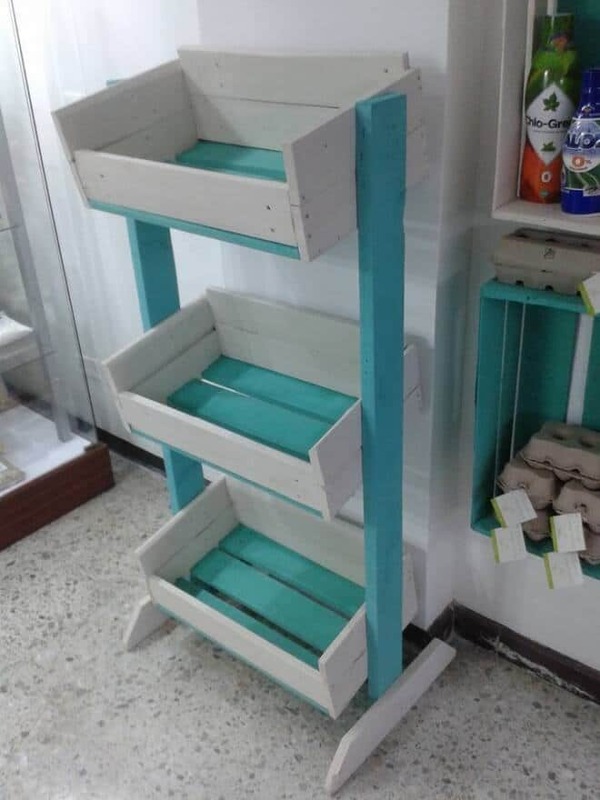 Now you can create an affordable solution from discarded pallets! This pallet chest features a hinge closure. You can leave raw wood, or paint or stain it to match your décor. Don’t spend hundreds and hundreds of dollars on your dream porch swing! 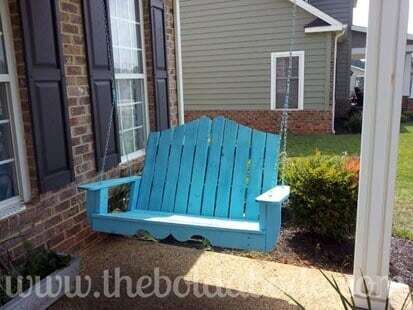 Make a pallet porch swing for next to nothing. You’ll need to search for quality pallet wood and purchase a chain for hanging. This tutorial walks you through the process of adding shape and curves to the pallet wood to create a beautiful swing. 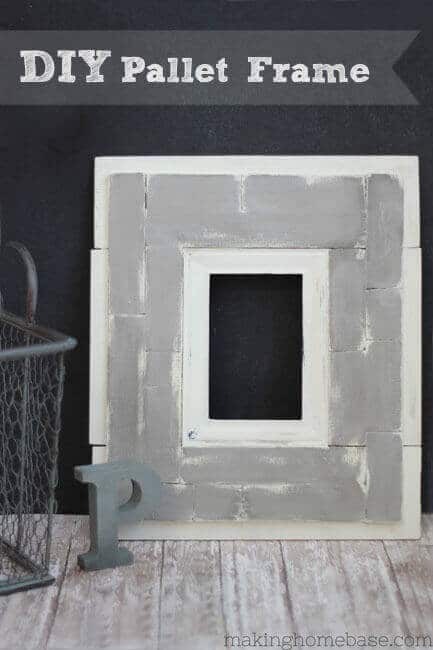 Save yourself a fortune on a store bought pallet wood frame. Make your own instead! 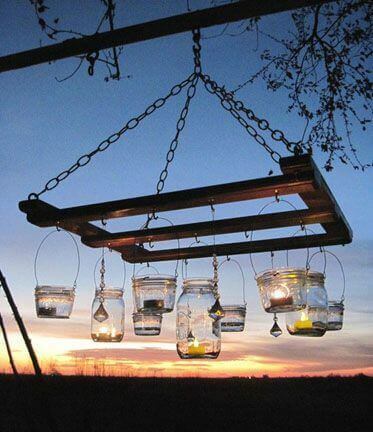 If you enjoy rustic outdoor lighting, this pallet chandelier is for you. You’ll need a wood pallet, metal hooks and chain, wire and a variety of Mason jars to hang from your wood pallet chandelier frame. With a little elbow grease, you’ll be enjoying dinner and/or conversation on your patio lit by candlelight in no time. Ready to give new life to your existing patio table? Upgrade your surface with a pallet table top! The process is fairly simple, but does involve tearing apart a pallet and cutting the wood to fit your existing table frame. You’ll have some sanding to do before experimenting with various painting/staining techniques such as acrylic paint white washing or applying a stain. If you choose, you can even keep some planks neutral or add some interest using a freezer paper transfer method. 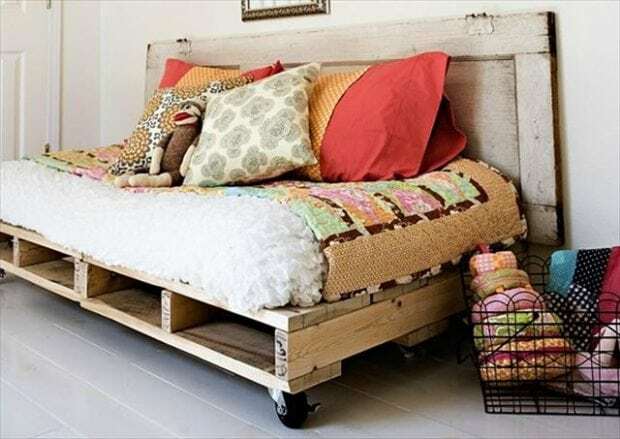 Pallet daybeds can be made in so many different styles, but are very trendy. They can be much more affordable than purchasing a headboard and frame. Be prepared to spend some time taking apart pallets, sanding, reassembling and staining or painting the finished project. 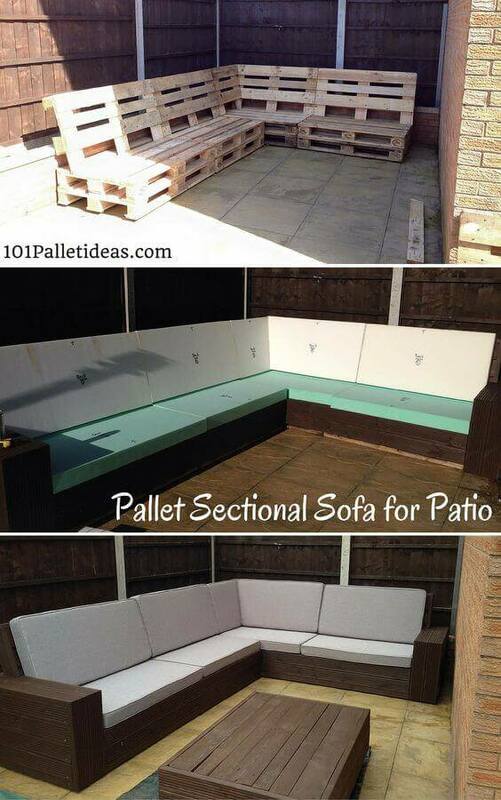 You’ll be surprised at how easy assembling this DIY pallet sectional for your patio is. It involves saving a lot of wood pallets and stacking them to create the seating you need. Cushions add a punch of color and a more comfortable seating area. 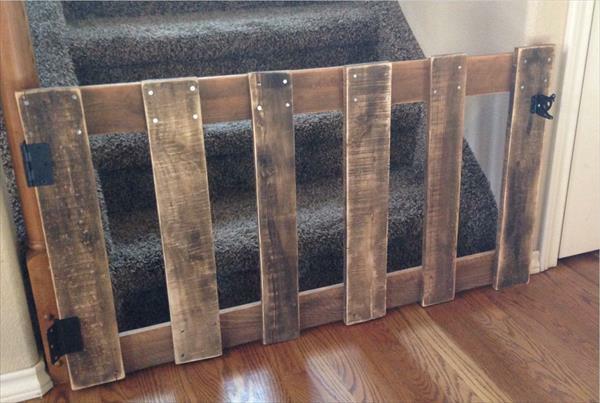 This DIY pallet baby gate is so much more attractive than those other baby gates, commonly seen in baby stores. You will need to ensure that your pallet wood is free from any splinters or sharp edges or nails and has been heat sealed. You’ll also need to ensure it is not sprayed with chemicals since many babies tend to lick and teeth on anything within reach. Isn’t this a stylish alternative to those plastic baby gates? 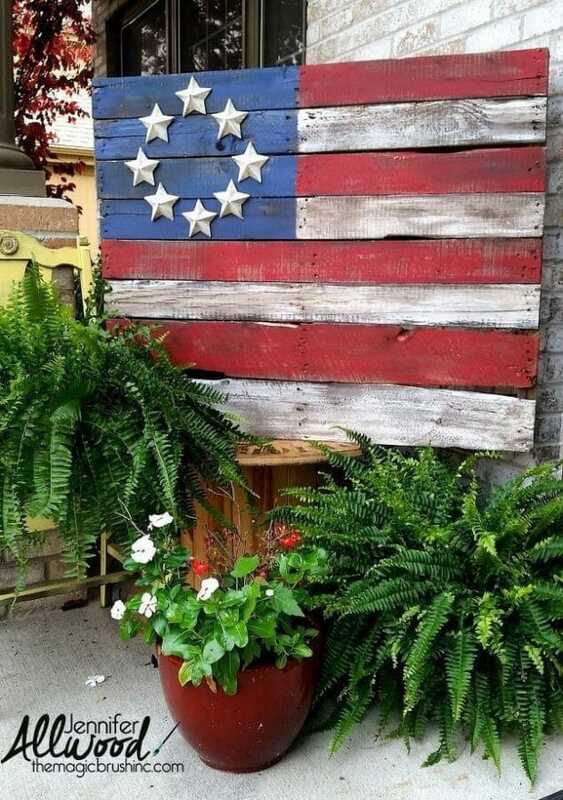 When Old Glory and an old pallet collide in a DIY project, you get this awesome pallet flag, perfect for hanging in or outside your home. The most time consuming part of this project may be prying all of the boards off of the pallet with a crowbar, but the result is worth the effort. Just remember, the cracks, crevices, and weathered areas will give your finished piece that rustic, old Americana look.